The acequias of New Mexico are communal irrigation canals; a way to share water for agriculture in a dry land. Their history stretches back over 400 years to when Spanish laws were applied to the irrigation systems that had been hand dug by the native Americans for perhaps hundreds of years before that. The system is a way to give equal shares of water to users in both wet and dry years. Acequia associations, led by the mayordomo (the ditch boss, or overseer), were often considered "the first governmental entities of their communities." In New Mexico, by state statute, acequias as registered bodies must have three commissioners and a mayordomo. 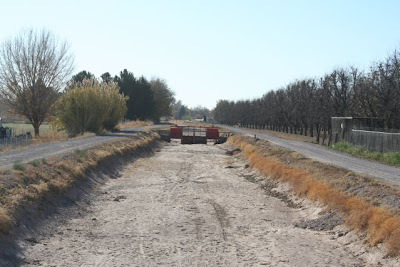 Irrigation and conservation districts typically have their own version of mayordomos, usually referred to as "ditch riders" by members of the districts. From Ask.com, definition of acequia. The main canal, called the mother ditch, is dug starting at the river, and flows gently downhill from there, with a series of smaller ditches, or laterals, bringing water to specific fields. 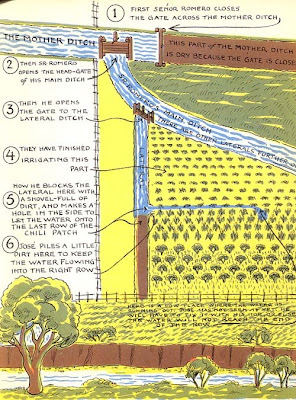 If you click on the illustration above, from The Mother Ditch, by Oliver LaFarge (1954), you will see how a series of gates and some judicious moves with hand-held hoes direct the flowing water right to the individual plants and trees. 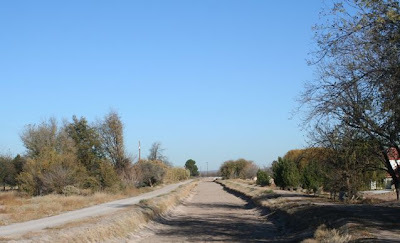 As we walk around our new neighborhood, we see ditches, large and small, all around the pecan orchards and chile fields. I've seen the truck from the irrigation district coming around in the middle of the night; I can make out the man in his headlights, turning the wheels that raise the gates to let the water into the waiting canal. I hope to figure out the schedule so that I can take some photos of our local ditches when they are full. Answers.com: Definition and historical background for "acequia"
An Irrigation Ditch Runs Through It, by Peter Fish for Sunset Magazine, 1997. This article discusses Stanley Crawford, who moved to northern New Mexico and eventually became the mayordomo of his acequia association, writing about his experiences in farming and community in his classic book, Mayordomo, winner of the 1988 Western States Book Award fro Creative Nonfiction. The Mother Ditch, by Oliver LaFarge (1954). Originally written as a children's book, LaFarge's work is rich in detail about the working of the acequia system in both good and bad water years. I am lucky enough to have an old copy that was being discarded from a library years ago. New Mexico Acequia Association (Official Website and Blog). Did you know that there is even a radio program "exploring the richness of the acequia culture?" Will Impending State Regulations Undermine Local Acequia Management? Article by Katey Byrd, written for Periodistacostilla.org. At the Bosque: Who Lives Here?